On one of my trips between Salt Lake and Phoenix I decided to make a slight detour and stop at Bryce Canyon National Park. I was hoping for some gorgeous photos of soaring ruddy cliffs and orangey spires in the setting sun. The weather had very different ideas. 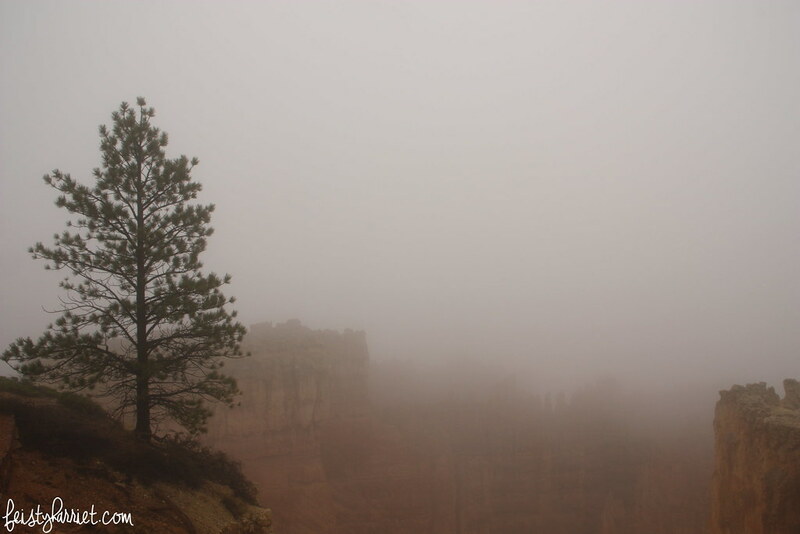 The entire canyon was smothered in fog, from the rim you could hardly see anything below. On a whim I decided to hike down into the canyon, hoping for a few awesome shots. I was absolutely unprepared for such a hike, I was wearing sandals, no water, and no real rain protection. But, the Navajo Loop trail is just a little more than a mile, descending down the canyon walls, through Wall Street, wandering along the bottom of the canyon with the creek and the pine trees, and then back up again. I figured it couldn’t be that bad. This is Wall Street, it’s easy to imagine these soaring cliffs as enormous sky scrapers, right? The trail was wet and pretty slick, I carefully picked my way down the switchbacks, big camera in hand. It’s hard to imagine how enormous these cliffs are, how tiny the hikers seem. But, lawsy, those views!!! From the bottom of the canyon looking back towards the rim, I felt like I was in a completely different world from the one at the surface. There weren’t may people there, and it only added to the creepy-beautiful feeling, eerie and other-worldly and heart-breakingly quiet. The weather cleared up as I made my way out of Wall Street and onto the rest of the Loop trail, there were cedar trees and sherberty colored stripes and outcropping hoodoos everywhere. 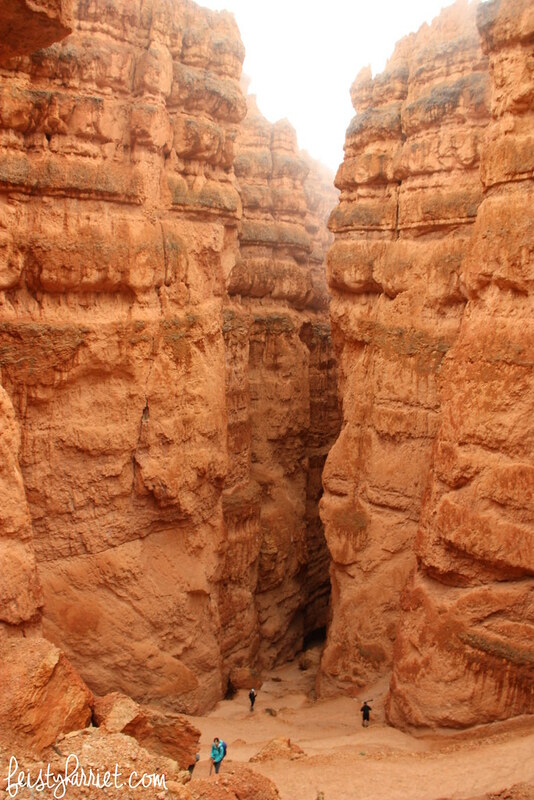 As I began to ascend the canyon wall, the weather began to make me a little nervous. The drizzle of rain turned much more sleety, it got colder and the wind whistled through the formations. The trail was slick and muddy, my sandals slapped and slipped on the rocks. I carefully picked my way upwards, trying to shield my camera from the rain and simultaneously keep my balance with my very inappropriate footwear. 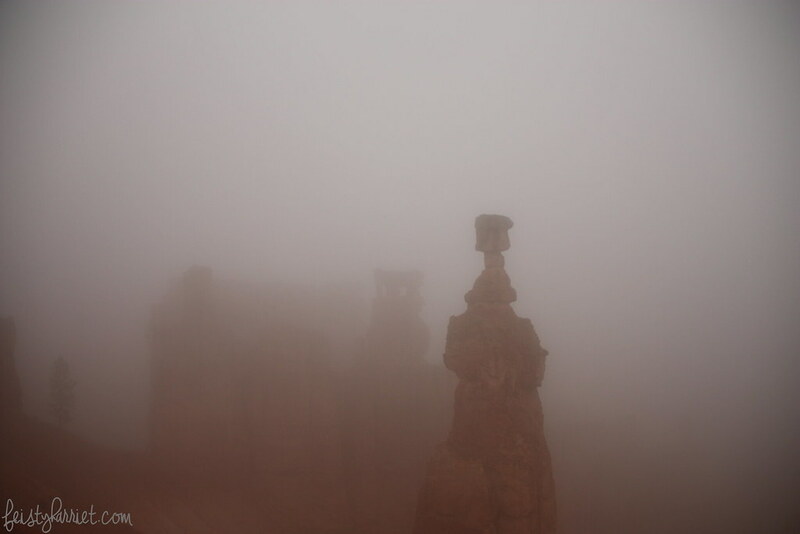 It got foggier and foggier, I could really only see about 20 feet ahead of me when I came across Thor’s Hammer, one of the more photographed formations in Bryce Canyon. Within 30 seconds, the fog had swallowed this formation completely. I hurried as quickly as I could back to the rim, picking my way, slipping and sliding on the now completely empty trail. The fog topside was thicker and heavier than before, I was relieved to get back in my dry car and crank up the heat. Even though this was a very quick stop, I really loved my short hike and these images. 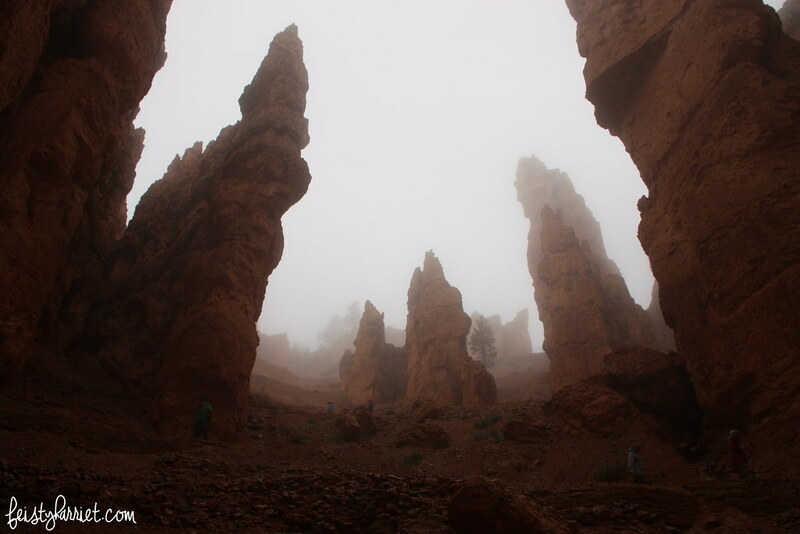 Have you been to Bryce Canyon? 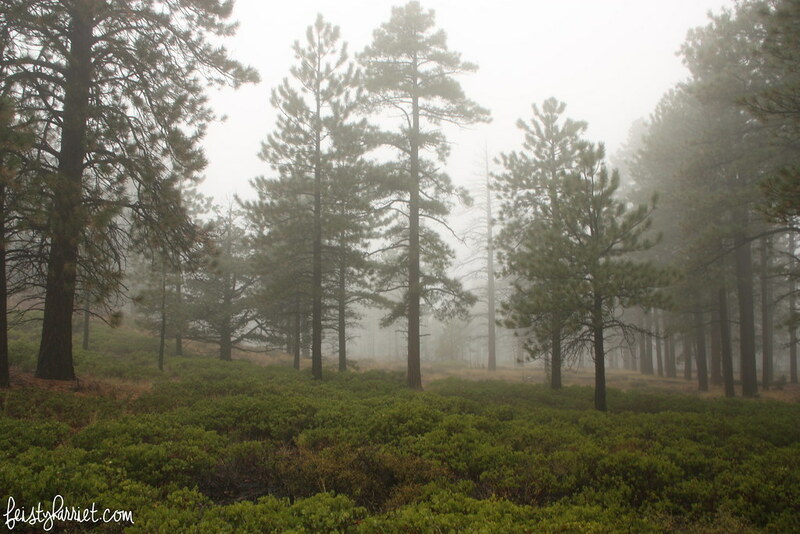 Have you ever hiked in the fog? Tell me your stories! This entry was posted in Far Off Places, National Park, Photography, Red Rock Country and tagged Bryce Canyon, National Park, Photography, Southern Utah, Travel, Traveling, Utah by Feisty Harriet. Bookmark the permalink. 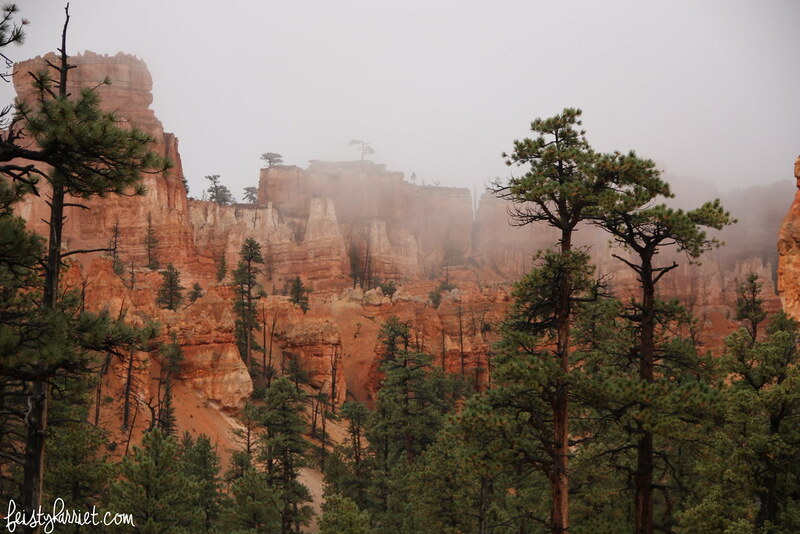 Yes I’ve visited Bryce Canyon but not in the fog, it’s really beautiful , I also love Zion. Have you been there, too? Bryce is a favorite family vacation destination! There is just so much to love!! I haven’t been to Bryce but it’s on my list of national parks to hit. 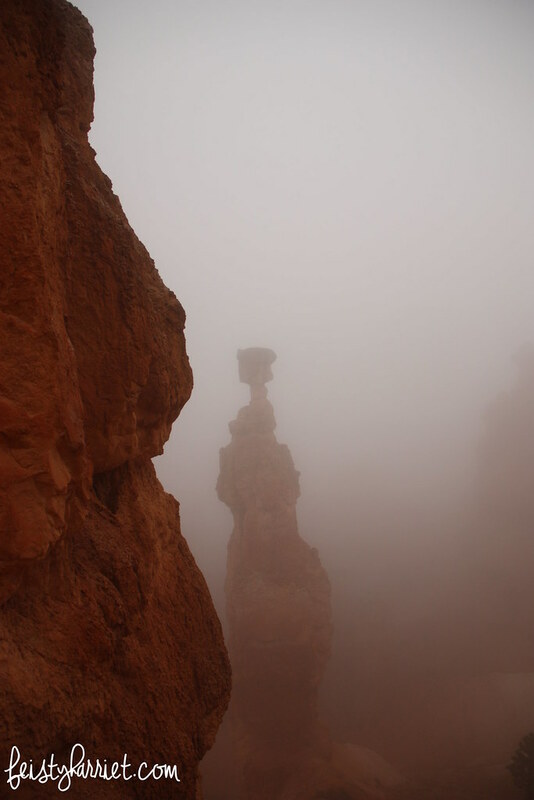 While getting photos of Bryce on a clear day would have been cool, these foggy pictures are awesome! What a cool hike. The view when it’s clear is stunning, but I am really glad I stopped and didn’t let the fog/freeze deter me from wandering around for a while. 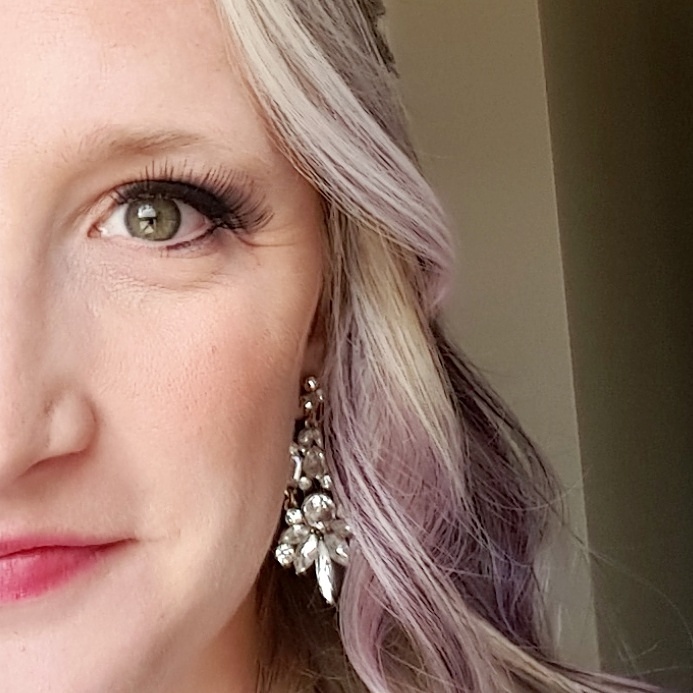 I am loving these images! Hiked in all kinds of weather. Fog, hotness, snow, mud… you name it. One of my fave hikes recently was last summer in the Spring mountains when it was a million and five degrees here in the valley. A rain shower popped up when I was about halfway through and cooled me off and felt AWESOME. Also: You + photography = photo book. This needs to happen. I think Bryce is my favorite Utah park. For me it is like a metaphor for what life feels like…all that weathering and breaking in order to make something so beautiful. 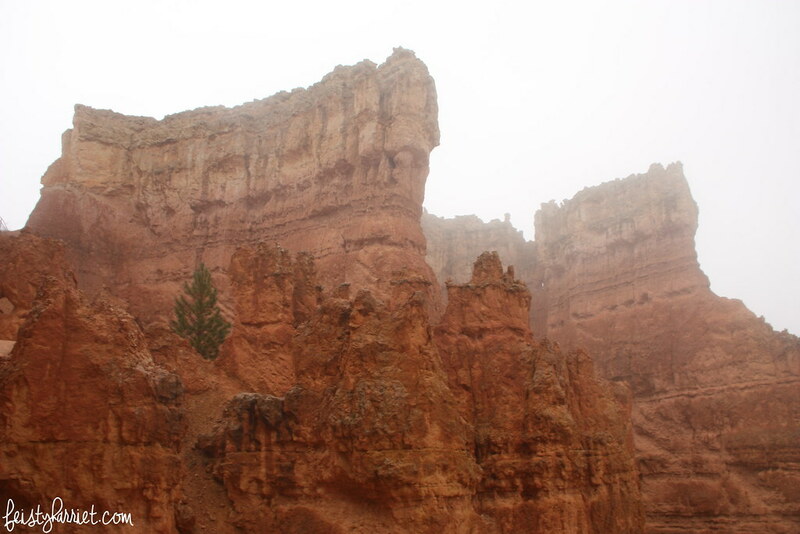 I’ve been in a rainstorm at Bryce—we were coming up Wall Street and it started pouring. The lightning over the cliffs—I won’t ever forget that! Your pictures are gorgeous and amazing!!! Oooh, that would be so creepy-lovely!!! We are actually (tentatively) planning a trip this summer to Yellowstone and I want to hit up some of the Utah parks on the way. I may need to get your recs on where to go. Ooooooh! I think with your kids Arches would be a fantastic stop, there are some easy walk/hikes and lots of family-friendly bits and pieces. Bryce is stunning, but not quite so small-fry friendly. Lots of drop offs and very few security guard rails. Canyonlands is like a mini Grand Canyon, and is right there in Moab with Arches. Zion would probably be a good place to stop as well, but you’d have to do it on the opposite end as Arches because they are…not close. Ha! We should chat more about this!